The Curious Case of Benjamin Button, originally a short story by F. Scott Fitzgerald, then a film by David Fincher, tells the story of a man who ages backwards. In the movie adaptation, the seemingly ageless (I mean, c’mon…really) Brad Pitt is the perfect lead as Benjamin Button, a child who is born a small old man, who grows into a middle aged man, and so on, progressively getting younger as time passes. With such a unique and logic-defying concept, we at planIT HARDWARE immediately were reminded of how digital technology and its hardware progresses in much the same way. The first computers took up entire rooms; the first cell phone was as big as its inventor’s head. Now, we have palm-sized devices that fit in our pockets and serve several functions all in one small, sleek unit. 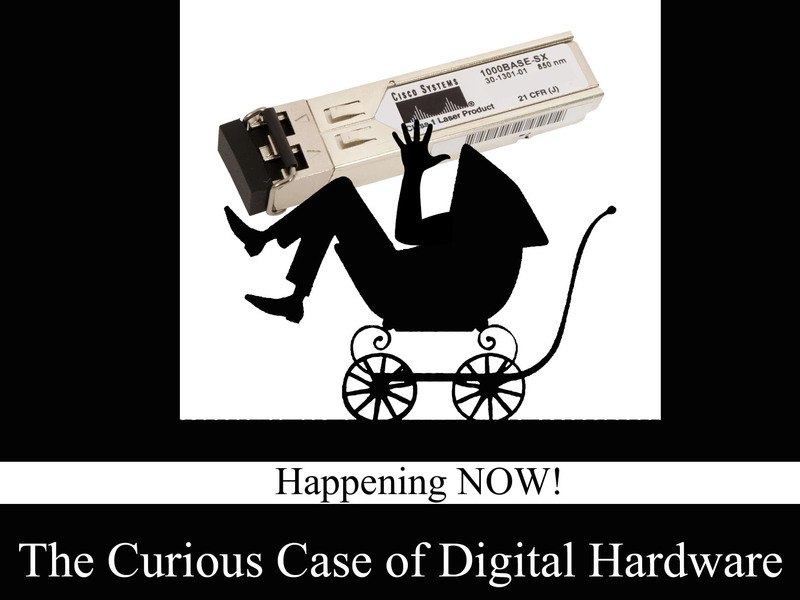 From boxy, slow and bulky to fast, compact and sleek: this is the progression of digital hardware, and it bears a striking resemblance to that of Fitzgerald’s character. Whether it’s new and slim or older and bulkier, we’ve got whatever you need here at our IT hardware warehouse, all in tip-top shape. With devices like the Apple “iWatch” in development, let’s just hope these technological advancements continue to focus on function and don’t devolve into mere childish gimmick. This entry was posted in Uncategorized and tagged benjamin button, brad pitt, curious case of, david fincher, digital hardware, end-of-life, EOL, f scott, fitzgerald, module, new in box, new open box, nib, nob, planIT, progression, sfp, technology, used IT hardware. Bookmark the permalink.